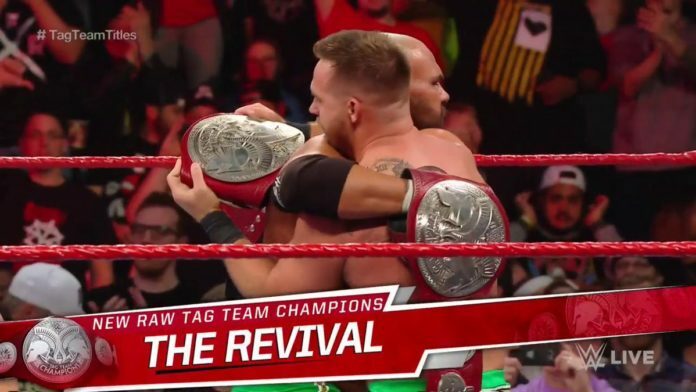 There are new WWE RAW Tag Team Champions and it’s The Revival (Scott Dawson & Dash Wilder). During Monday’s episode of RAW in Grand Rapids, MI at the Van Andel Arena, The Revival beat Bobby Roode and Chad Gable to win the straps. This was one of the best tag team matches featured on the flagship show of the company in recent memory. This marks their first reign as champions on the main roster for the former NXT Tag Team Champions. It’s also interesting timing considering that it’s been reported that The Revival were unhappy about their position in the company and recently requested their releases. Gable and Roode had been champions since the December 10th episode where they beat Authors of Pain and Drake Maverick to win the titles in a 3-on-2 handicap match. It will be interesting to see when Gable and Roode get their rematch for the straps but it’s likely to come as soon as the Elimination Chamber pay-per-view event that takes place on February 17, 2019 at the Toyota Center in Houston, Texas that will air on the WWE Network.